Estimated reading time: 10 minutes, 36 seconds. Fall is here! The days may be getting shorter, but that doesn’t mean your to-do list should too. After all, the holidays will be here before you know it. That makes fall the perfect time to get your home and finances in order so you’ll be ready for the holiday season and all the entertaining, gift-giving and added expenses that go with it. Fall is the perfect time to get your home and finances in order so you’ll be ready for the holiday season. Below are some important home repairs and improvement projects you can focus on this fall. Many you can do yourself and save money. A small investment of some time, money and effort now, could save you thousands of dollars in potential future repair, energy and maintenance expenses. And while you are fixing up your home, don’t forget about your finances! To help you financially prepare for the onslaught of holiday expenses, as well as expensive home repairs or emergencies that arise, we’ve included some strategies you can use to start growing your savings. When was the last time you cleaned your carpets? If it’s been awhile, now is the time to get this chore done. People and pets bring in dirt, leaves, and other debris that not only look bad but can actually damage the carpet fibers. Plus, there’s the spilled liquids, dropped food and pet accidents that can also ruin your carpets. Cleaning your carpets can help make your carpet look like new in time for your holiday guests. You can hire a pro to clean your carpets or do it yourself. Here are some DIY carpet cleaning tips from Popular Mechanics for removing stains, gum, grease, blood, and more. 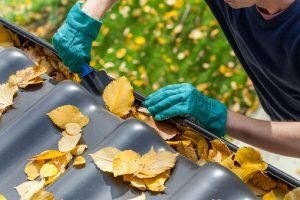 Cleaning your gutters, especially in the fall after the trees have lost their leaves, is an important chore that many people overlook – until they experience a problem. And those problems can be major and costly. Gutters that are clogged with sticks, leaves, pine needles and debris stop or slow proper water drainage off your roof. Clogged gutters can cause a range issues including roof and wood fascia board damage, roof leaks, landscaping and foundation damage and more. Gutters filled with leaves can also house insects and rodents. Some people choose to clean their gutters by themselves, but it can be dangerous. Hiring a trained professional for your gutter cleaning typically does not cost a lot and can save you hassles, possible further damage, or even worse– an injury. Raking is the quintessential fall chore. An overabundance of leaves on your lawn not only looks untidy, it can also be bad for the grass. Nutrients and water may not reach the roots, and a layer of leaves can attract pests and host diseases that can cause brown patches or snow mold. Popular Mechanics shares some tips on how to rake leaves like a pro. Since repairing a roof can be a risky task, it may be wise to call a professional if you notice any problems. Taking care of any roof issues now will help ensure that your roof will be ready for the winter weather. Help prevent slip and fall injuries and protect your home’s curb appeal by filling, sealing and repairing any cracks, splits and holes on the surface of your walkway or driveway. Holes and cracks that are left unfixed into the winter can expand even more as water fills the holes, then freezes and thaws, causing further damage. Areas that too deteriorated may be unfixable and will need to be completely replaced, which can be costly. Whether you handle the job yourself or hire a pro, regular maintenance of walkways and driveways is essential for safety, aesthetics, extending the life of the surface and avoiding even more expensive repair costs in the future. If you’re up for doing it yourself, read these DIY driveway repair and maintenance tips from Lowes. energy-efficient light bulbs such as halogen incandescent bulbs, compact fluorescent lamps (CFLs), and light emitting diodes (LEDs). These types of bulbs have earned the ENERGY STAR® label and according to Energy.gov, use about 25%-80% less energy than traditional incandescent bulbs and last up to 25x longer. While initially more expensive than traditional incandescent bulbs, these energy-efficient bulbs will save you money in the long-run. To get an estimate of how much you could save each year, use this light bulb calculator. Ceiling fans keep you cool in the summer, but did you know that they can keep you warmer in the fall and winter? Flip the switch of your ceiling fans to make it rotate in a clockwise direction at a low speed. This will redistribute the warm air that rises to the ceiling, down toward the floor. You’ll stay comfortable and save on your heating costs. As the temperatures drop, your heating costs will rise. Keep your heating expenses at bay by making some energy-efficient improvements throughout your home. Add more insulation to your attic in areas where the current insulation is level or below the ceiling joists. Cold air can sneak in—and warm air can seep out —through gaps around windows, exterior doors, garage and basement doors, and even exterior vents such as a clothes dryer vent or wall air conditioner. Check for air leaks in these areas and add insulation like weather stripping around windows and doors, attach door-sweeps to the bottom of exterior doors, and use shrink-film to seal windows. Get more tips on how to check for and fix air leaks throughout your home in this DIY Network article. Checking your home’s smoke alarms and carbon monoxide detectors and replacing their batteries should be two fall task priorities. You don’t want to find out too late that your smoke alarm’s batteries have died or that something has a broken part. The U.S. Fire Administration (USFA) suggests checking the detectors once a month and replacing the batteries twice a year, when you change your clocks for daylight saving time. According to the U.S. Fire Administration (USFA) every bedroom should have a working smoke alarm and all smoke alarms should be replaced every 10 years. The fire safety product manufacturer Kidde recommends having a carbon monoxide alarm on every level and in sleeping areas. If you don’t have enough smoke alarms or carbon monoxide detectors in your home, now is a good time to buy them. Most smoke detectors and carbon monoxide detectors are less than $50. A small price to pay to help keep you and your home’s occupants safe. Visit the USFA website for more information about the importance of smoke alarms. Checking your home’s smoke alarms and carbon monoxide detectors and replacing their batteries should be two fall task priorities. Falls due to stairs and handrails in disrepair can cause serious injuries to you, your family and your guests. Go through your home and examine your stairs for loose or torn carpet, uneven steps, and loose or broken handrails. Fix any problems as soon as possible. As you’re getting your home ready for winter and the holiday season, get your finances ready too. Start planning now for all the expenses you may incur throughout November and December and beyond. Having funds set aside in savings for holiday gifts, travel, entertainment and household repairs and maintenance can help you avoid relying on credit cards and getting stuck in a cycle of revolving debt. Open a savings account, preferably one that offers a high-interest rate. Consider opening two separate savings accounts – one for holiday expenses and one for emergencies such as home and car repairs or other urgent expenses. Designated a fixed amount of money to be transferred from your checking account to each of your savings accounts. Decide the frequency of the transfer (weekly, bi-weekly, monthly, etc.). An automatic savings plan makes saving money simple and hassle-free. Once you set it up it, the money will transfer automatically on a recurring schedule and you don’t have to think about it. It forces you to look at your savings contribution as a set expense and in time you will learn how to live with less. Start automating your savings now and by December you could have a substantial amount of money saved for your holiday expenses. You’ll also have funds available for unanticipated home, car or even medical expenses. Learn more about automatic savings plans and read this Omni blog. Cutting back may not be fun but making a few sacrifices every week or month can really help you in your quest to build your savings. Make your own coffee or lunch every day instead of purchasing them. Reduce your cell phone plan or cable television package – or cut the cord completely. Stay in and watch a movie instead of going to a movie theatre. Look at your bills and your spending habits and examine the ways you can cut back. Deposit the money you save in your savings account and leave it untouched until you need it for holiday or emergency expenses. Some cuts may be more painful than others but keep your eye on the prize – more savings and peace of mind and less dependence on credit. The rising cost of living can make it difficult for military families to manage monthly expenses while also building a solid savings reserve. If possible, you or your spouse may want to consider taking on a side gig. Match your skills and interests with a flexible, part-time job that could help you raise extra income that you can allocate toward your savings. Caregiving, pet sitting, dog walking, party planning, and tutoring are just a few options. This time of year many retailers are starting to hire extra holiday help so there may be opportunities to get a temporary job at a store as well. Whether it’s a misguided impulse purchase or clothes your children outgrew, almost everyone has unused or unwanted items around their home that are sitting in a closet, attic, drawer or basement. Turn those items into funds you can put in your holiday or emergency savings account. There are plenty of opportunities to sell your stuff including having a garage sale, going through a consignment store, or listing your items on eBay, Craigslist, Decluttr, and apps like Letgo, Poshmark and many others. Before posting your items for sale, be sure to review the selling platform’s policies to ensure that you are adhering to their regulations. If you are considering selling on eBay, check out our articles eBay Selling Tips and What NOT to Sell on eBay. According to NCH Marketing Services, coupons helped consumers save $3.1 billion last year. Get your piece of the savings pie. Before shopping for groceries, electronics, clothing or anything else, do your research to see if there are any coupons or discounts available. Scour the local newspapers for coupons or look online for coupon codes. Read here some tips on where to find coupons and how to use them to squeeze the most value from your dollar. Also, always look for any military discounts you may be entitled to. Many businesses have advertised and unadvertised military discounts available as a way to thank you for your service to our country. If you don’t see a publicized military discount, simply ask if the business offers one. Why pay more than you have to? Take advantage of coupons and discounts but don’t use those savings as an excuse to spend more. Stash the money you save in your holiday and emergency savings account. Using these tips can help you get your home and your finances in order so that you’ll have less stress this holiday season and more savings to support your financial goals. The information provided in this blog post is for informational purposes only. It should not be considered legal, repair, home improvement, safety, or financial advice. You should consult with a financial or home repair/improvement professional to determine what may be best for your individual needs.